Wednesday, September 12, 2007 --- Baby Steps Toward A Greener Life...Our realistic plan for making small, eco-friendly changes in our home for a cumulative impact. One of the things I have been really enjoying, since the upgrade/changes to our cable service sometime back in the Spring(? ), has been the addition of the Sundance Channel. Aside from wonderful indie films, they also have a fair amount of Eco-related programming, known as "The Green" which I find fascinating. One of my favorite programs -- "It's Not Easy Being Green" -- documents the Strawbridge family and their self-sufficiency project. They picked themselves up and moved to Cornwall, England to create a completely "green" existence -- producing no waste and eliminating their dependence on fossil fuels. To me, it is a very exciting and inspiring show. But, it is also quite daunting and discouraging. As apartment dwellers, I have often felt that while the man and I may want to live a more environmentally-conscious life, apartment dwelling by its very nature means that almost everything about your living space is not under your control. The appliances do not belong to us, we did not choose the water-heating system, going solar is not an option, I can't remove the cancer-causing vinyl siding, etc. You get the picture. 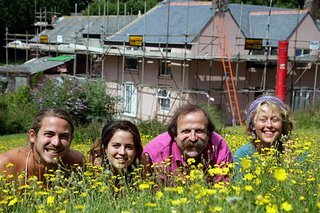 While these shows can be inspiring, realistically, the average person cannot afford to just pick up and move somewhere to create a "Green Utopia". Oftentimes, it feels like making "real" changes are not in the cards for us until we own our own home -- and even then, I have a feeling that some of the changes I dream about will not be affordable for us. But I can dream...and I will. And, hopefully, it will be possible. Another thing I have been very into over the past year has been Eco-related podcasts. Before we had the Sundance Channel, I was already watching their Eco Biz video podcasts, as well as some other great podcasts I have found on iTunes. 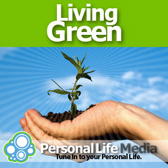 One of my best discoveries has been a podcast from Personal Life Media called Living Green: Effortless Ecology for Everyday People. Host Meredith Medland interviews people from all areas of the Green Movement -- scientists, activists, concerned famous folks, "green" business owners and regular people who have made remarkable changes to their planetary impact through their daily choices. She talks a great deal about the "psychology of green" -- about changing people's mindset regarding what it means to be "green" in the first place. It's not "just for tree huggers" anymore, baby! It needs to become such a habitual, natural part of life, that you wouldn't think to do anything else. That is the only way that substantial, significant change can happen...by making it an integral part of our culture, NOW...through podcasts and other media, activism, research and development of new technologies, architecture, etc. When consumers have better choices and affordable choices for greening -- why wouldn't they choose to do the right thing? A big part of what Meredith tells people is that they need to "remove their guilt" about not being "green enough." Make small, daily changes -- stick with them, build upon them -- before you know it, you will have made many! And, you will feel good about it...which will inspire you to continue doing it. When you look at it that way, it seems do-able. Pick something and try it! During the course of Meredith Medland's many informative interviews with all types of fascinating folks, she introduced a lady named Jen Boulden. Jen Boulden is a co-founder with Heather Stephenson of www.IdealBite.com. Essentially, Ideal Bite is just that -- a manageable "bite of daily green" -- a website that delivers easy and realistic, Eco-friendly tips via email Monday-Friday to get you on the gradual road to Greentown. The tips are so easy to do, you will be making changes in no time! Plus, they offer great information on products to replace the more harmful ones you may be buying now...it really helps to support the businesses that are concerned about supporting the planet and the consumer, not just their bank accounts. The more we support them, the more commonplace environmentally conscious companies will be. One of the disturbing things I have learned from these podcasts -- how bad scoopable clumping cat litter is for the environment -- as well as for human and animal health. Not only is it destructive because of the strip-mining for clay, but it is not biodegradable, it is clogging and filling landfills at an alarming rate with its expanding-cement-like-presence, the clay is filled with carcinogenic silica dust, and...as if that wasn't enough...the major clumping agent is sodium bentonite which is poisonous. Between breathing the cancer-dust (us and the cats), licking the poison-dust through grooming (just the cats), and what it is doing to the earth and landfills...there is nothing good about it. I had long suspected it was probably bad, but in the absence of actually "knowing", I continued using the litter. This got me thinking. Because it was more than just the cat litter. For a long time, I have been really disturbed by the quantity of plastic bags that we have after a trip to the grocery store. I can not remember the last time I was in a grocery store that still offers a choice of paper or plastic? At least the paper would be biodegradable...even if it still kills trees to produce it. My theory had always been, since I needed to scoop the cat litter, I would save the bags and "recycle" them by using them for the disposal of cat waste. It wasn't recycling exactly -- more like "reusing" before its eventual trip to the landfill...stuffed with my carcinogenic, poison-chemical-laden, cat feces and urine. All I was doing was delaying the trip, not really recycling anything. But, these are the little mental games we play with ourselves while we are busy scooping poop. This was no longer acceptable to me. Period. So, the question became, how do I eliminate my dependence on these plastic bags while still having the cleanliness of a scoopable clumping cat litter? 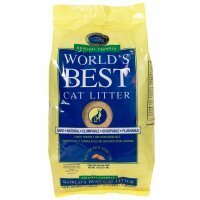 Could I find an Earth-friendly, biodegradable cat litter that still made scoopable clumps? That maybe I could flush instead of putting in the bags? I did some research and found this cat litter made from corn. 100% natural, biodegradable, scoopable, flushable, so-safe-you-can-eat-it cat litter made from corn! 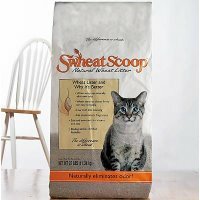 I also found this cat litter made from wheat. 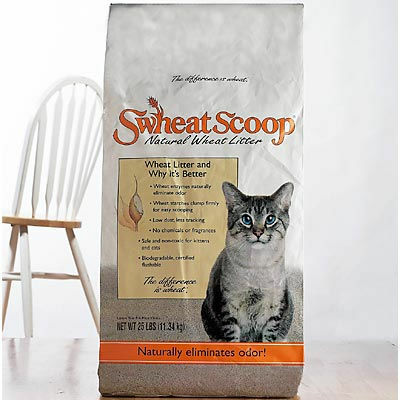 100% natural, biodegradable, scoopable, flushable, so-safe-you-can-eat-it cat litter made from wheat! All right, so maybe no one is going to eat it, but the point is -- our cats can lick themselves without ingesting silica dust and sodium bentonite!! In preparation for our No-More-Plastic-Bags-Transition, I am very proud to show all of you the 100%-Cotton canvas bags (12 to start!) 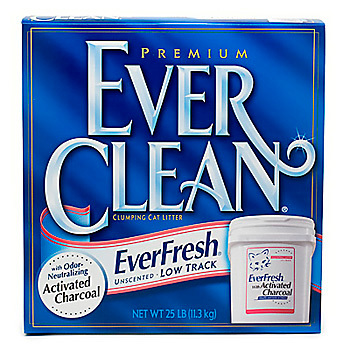 that I bought (pretty cheap at Michael's) for us to use at our local supermarket. I am very excited about this. I invite the stares. I welcome the smiles and questions. I anticipate the possibility that someone will see us shopping this way...and decide to go out and get their own bags. And maybe, just maybe, some of you darling readers will be inspired to start making some "baby-steps-changes" of your own -- and tell me about it! Send me pictures, send me stories, I would love to hear about what you are doing -- or have decided to do. I'll post them here so that we can share our ideas and progress. We have some other ideas that we will be implementing in our home. As they occur, I will talk about them here on the Butterfly Blog. I imagine by this time next year, that my list of "changes made" will have grown in number -- at least, I hope so. I look forward to seeing it happen! Go Team Green! "Nutmeg and Plastic" and "12 Canvas Bags" photos by the butterfly. That's Me! butterfly blogged at 1:37 AM | 8 flutter marks left | Email this post to a friend. Want more to read? Check out the TBB Archives! www.vanessaleehamlen.com - THE BUTTERFLY BLOG - Copyright ©2007 Vanessa Lee Hamlen. All rights reserved. I am a graphic designer. I love animals and have quite a few pets. There is a frustrated DJ inside of me --- hence, my ongoing obsession with making music mixes. Casual Gameplay...We love Jay Bibby and JIG! What has been going on in Butterfly's cocoon? In Sunnier News...the Foetus Update! Trudy's Last Day...it's a sad day indeed. LORI'S LABOR: A collection of 6 unique playlists with varying intensity and mood for your listening pleasure! I created these original mixes for my friends to use during the labor and delivery of their first baby, Nicholas. You can visit their blog here: ---> The Bridenstines! 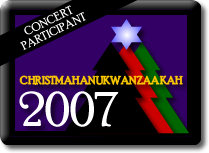 Listen to my comical, purposefully nasal, total HAM-job submission to the 2007 Blogger Christmahanukwanzaakah Online Holiday Concert in the mini-player above! daysies.nu - the daily overdosage NEW! IF YOU ARE ON TWITTER: You can use this button to twit about my blog in your tweets! HELP HINT: To send an individual post, click on the Permalink TimeStamp at the bottom of a post -- then, click my TwitThis! button here. Like my blog? Use the button below to submit TBB to Digg! This is a Flickr badge showing photos in a set called vlh_butterfly's photos. Make your own badge here.